Mi ne lernas Esperanton, sed mi legas Esperanta tekston. Oh my God, I did not learn it, I swear!! I believe you. Just keep your head down and don't let them find you. Don't worry Hitler's been dead for a while now... unless he's come back as a zombie! And (IMHO) this is where it belongs. We don't need another artificial language. We need a simple one anyone can understand, speak, read and write. I think Esperantists would argue that's exactly what Esperanto is - a simple one anyone can understand, speak, read and write. You're right, Malachi, but let's not get side-tracked by this "artificial" tag. How much of our culture(s) is made of stuff that is totally un-artificial? Do we reject houses, cars, glasses, computers, false teeth, hearing aids, aeroplanes for being "artificial"? 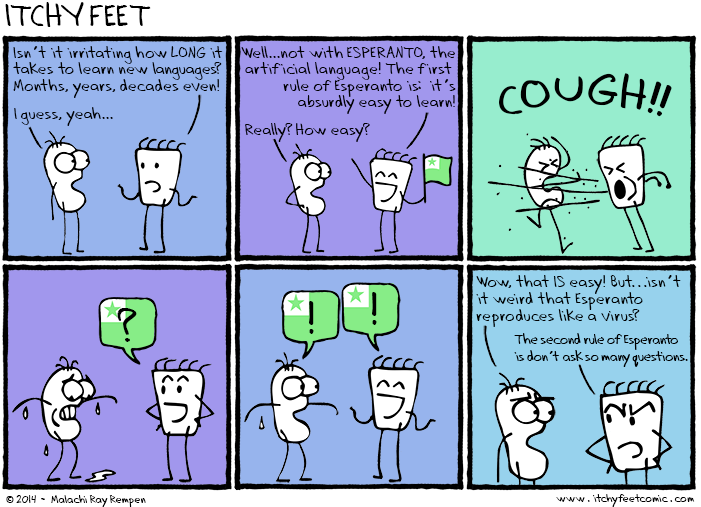 The simple truth is that Esperanto works for the purpose for which it was intended - i.e. as a bridge language between people of disparate linguistic backgrounds. As a spin-off from that, there's a whole Esperanto subculture, which most cynics refuse to acknowledge. What I say is: Don't deny it - Just try it! (Full disclosure - I've been an Esperantist since 1966 or thereabouts. I completely agree. I don't think Esperanto should be embraced or discounted due to its artificiality. Any language that's been standardized is, in a sense, artificial. And if something artificial is something man-made, EVERY language is artificial! So that's completely a non-argument either way, in my opinion. Esperanto should be judged on its own merits. Haha, Mi ĵus Ĉinigis vian bildliteraturon. Haha, I just translated your comic into Chinese. Bonege, mi lernas la ĉinan nun, ĉu vi havas ligilon? On the other hand, English is just not easy enough to reach cult-like support. Most people calling high and low about how it's the only world language they ever need don't really speak it. The trouble with Esperanto is that it's sexually biased. There was an attempt to remove that aspect, but the Esperanto community refused to change to a more egalitarian form.